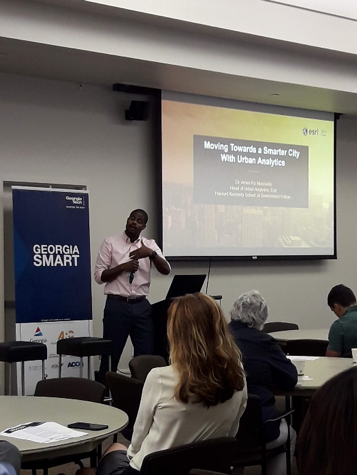 Georgia Smart hosted over 85 local government representatives, academic researchers, and industry representatives at the Georgia Tech Research Institute Conference Center for their Fall GA Smart Workshop on September 6th, 2018. In June, GA Smart announced its inaugural four winning community teams. With Georgia Tech’s support of $50,000 in seed funding, networking opportunities, and access to additional research teams, the program offers a first-of-its-kind opportunity for communities to envision, explore, and plan for their “smart” future. The workshop was the first opportunity for the four teams to discuss their winning proposals. Workshop attendees were eager to hear from the four winning communities. First up was Chatham County’s team led by CEMA Coordinator, Randall Matthews and Georgia Tech’s Kim Cobb and Russ Clark who discussed how hurricanes Matthew and Irma highlighted the need for smart sea level tools for emergency planning and response. The City of Chamblee’s team led by Special Projects Manager Rebecca Keefer and Georgia Tech School of Architecture Professor Ellen Dunham-Jones addressed the future of shared autonomous vehicles. From the City of Albany, Chief Information Officer Steven Carter and Georgia Tech Assistant Professor of Georgia Tech School of Public Policy, Omar Isaac Asensio, discussed their winning proposal on housing data analytics and visualization. 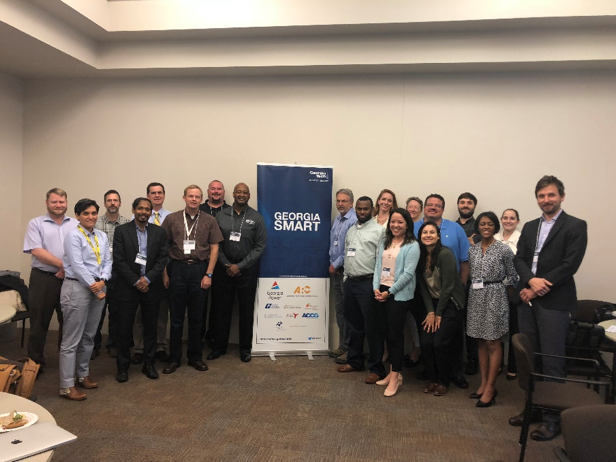 Lastly, Gwinnett County’s Deputy Director for Traffic Engineering at Department of Transportation, Tom Sever, and Georgia Tech Senior Research Engineer, Angshman Guin, examined the role of connected vehicles and traffic management. The morning session also included a panel discussion on Smart Communities and Equity. Panelists included Faye DiMassimo, Specialist Leader of Deloitte Consulting; Marilyn Brown, Regents Professor of School of Public Policy at Georgia Tech; Odetta MacLeish-White, Managing Director of Transformation Alliance; Paul Vranicar, Chief Policy Officer of Atlanta Housing Authority; and moderator Stan Vangilder, Program Manager of Southern Company. The panelists outlined the role of equity when carrying out smart city projects. Christopher Le Dantec, Associate Professor in the Digital Media Program at Georgia Tech, facilitated the afternoon session, leading the four winning communities in a three-part exercise on stakeholder maps, barriers and strategies, and engagement plans. Georgia Smart is organized by the Georgia Institute of Technology in partnership with Georgia Power, Atlanta Regional Commission (ARC), Association County Commissioners of Georgia (ACCG), Georgia Municipal Association (GMA), Georgia Centers for Innovation, Georgia Department of Community Affairs (DCA), Metro Atlanta Chamber, Georgia Chamber, Technology Association of Georgia (TAG), and the Global City Team Challenge.